The current density (current per unit area) of the electron beam is ie/π(d0/2)2, for instance, described by the Fowler-Nordheim (F-N) distribution for field emission source. Here, d0 is the beam diameter. Cs -- The spherical aberration coefficient. λ -- The wavelength of incident electron. Figure 3570a shows the ZLPs (zero-loss peaks) of a CFEG (cold field emission gun)  at various emission currents as well as the monochromatized ZLP  in logarithmic vertical scale. The inset lists the extraction voltages V1, probe currents Ip and the FWHMs (full width at half maximum) of the ZLPs. Note that the FWHMs quantify the energy spread. In general, the lower extraction voltage and probe current gives smaller FWHMs of the ZLPs, meaning that the higher energy resolution can be obtained, while the one with a monochromator still has the lowest FWHM. 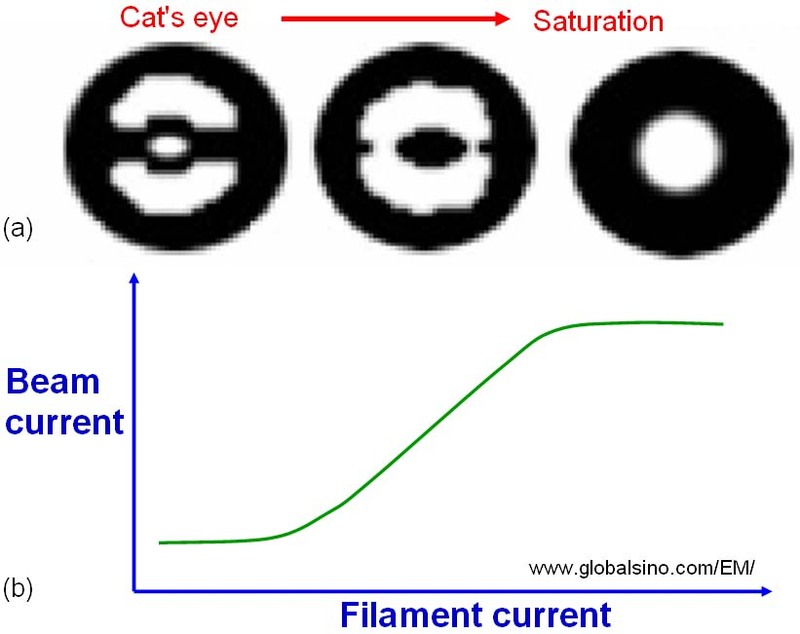 Furthermore, spherical aberration correction in EMs can induce a probe-current-density increase by a factor of 4 to 9. Not only will this enhance the signal-to-noise ratio of STEM images but also the signals for analytical electron microscopy, for instance, energy-dispersive X-ray spectroscopy (EDX) and electron energy-loss spectroscopy (EELS). ** ds -- Effective (or virtual) source diameter; ΔE -- Energy spread of the electron beam; φ -- Work function; T -- Operating temperature; E -- Electric field; Je -- current density of electron beam; β -- Electron-optical brightness at the cathode. In conventional EMs, the beam current increases with the increase of the filament current as shown in Figure 3570b. However, the filament current will finally be increased to a level which produces no greater beam current, called gun saturation. Figure 3570b. (a) The change of beam shape with increase of filament current, and (b) The variation of beam current with increase of the filament current. The probe current typically is in the range of 10 pA to 50 nA depending on different types of EMs and operation modes. Given the constant brightness and illumination half-angle, to increase the current the beam size has to be increased, indicating the spatial resolution will be worse. For instance, a probe current, applied in a JEM-2100F equipped with a delta corrector and cold field emission gun operated at 60 kV, to analyze monovacancy in single-layered h-BN (hexagonal boron-nitride) by STEM-EELS was approximately 40 pA. Typical high-dose STEM imaging conditions with a dose of ~1.0 x 108 e-/Å2 are an electron beam current of ~50 pA, a pixel dwell time of 20 µs, and a pixel size of 0.05 Å2. In order to improve the energy spread of the electron sources in EMs, monochromators have recently been introduced. In the best cases, the energy spread with a monochromator for any source can be reduced to < ~100 meV. There are two basic setups: the Wien filter with crossed electric and magnetic fields and the electrostatic Omega filter. It is very common that both types improve the energy width to about 0.2 eV at an acceptable beam current of several 100 pA. On the other hand, lower beam current in the same electron source can be used to reduce the energy spread. Typical low dose STEM imaging can be performed at a dose of ~15-20 e-/Å2 with a probe current of ~1 pA and a scan speed of 1.0 µs per pixel. In the typical case with a Gaussian-function electron probe, 50-75% of the total beam current is contained within a disk with a diameter of the FWHM of the Gaussian profile and 90% of the total current is contained within the full width at tenth maximum (FWTM). Both widths are used as definitions of the probe size and spatial resolution; however, the former is normally quoted by EM manufacturers. 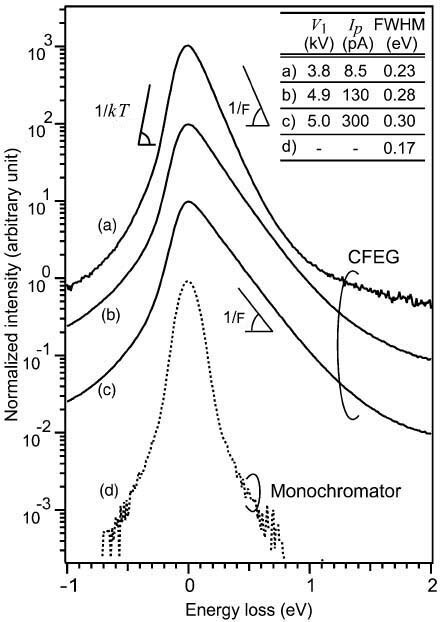 Note if the spatial resolution is defined by FWTH, the spatial resolution for a TEM probe can be more than 40x the FWHM.